Keep all essentials organized and secure with the ID and Credit Card Wallet from Strong Leather. Designed to coordinate with Strong's well-known uniform accessories, the billfold is crafted from quality black leather. 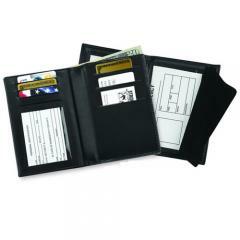 It features slots for credit cards, driver's licenses/IDs, business cards, as well as a place to stash money. Its portable size make this wallet perfect for slipping in either a shirt or pants pocket. Strong Leather's wallet makes a great gift for anyone in law enforcement or fire service who appreciates a well-made, everyday wallet without the unnecessary bulk. I'm happy with the item I ordered. Shield Badge with Panels - B798 - 1 3/4" x 2"